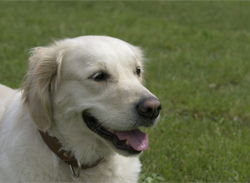 Shop for liver and brain supplements for your older dog at VetDepot.com. With improved nutrition, medical care and pet meds, dogs are living longer than ever. This is obviously all for the good, but it does present some new challenges for the owners of canine senior citizens. A dog's brain ages along with the rest of his body and needs some special attention if he is to continue to thrive through his later years. "In addition to drugs and supplements, environmental enrichment and stimulation can go a long way towards improving or maintaining a dog's mental abilities." Canine cognitive dysfunction is thought to be caused by the increased breakdown of neurotransmitters in the brain. The build-up of damaging free radicals may also play a role in CCD and the development of senility. If your dog has any of the symptoms of canine cognitive dysfunction or senility, take him to the veterinarian. A physical exam and routine laboratory testing can help rule out other diseases that may cause similar clinical signs. 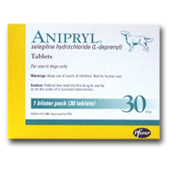 If your vet determines that your dog is suffering from canine cognitive dysfunction, he or she will probably prescribe a drug called Anipryl (selegiline) that often significantly improves a dog's condition over the course of several weeks to months. Many other supplements are also available that act as antioxidants and protect the brain from free radicals or otherwise may improve brain function in dogs. In addition to drugs and supplements, environmental enrichment and stimulation can go a long way towards improving or maintaining a dog's mental abilities. Activities such as leash walking, learning new commands or tricks, playing with toys, and interactions with other dogs can all help keep older pets sharp.